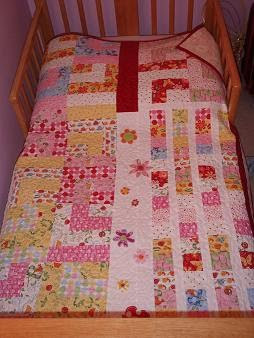 I've entered the Quilting Bloggers weekly contest - this time with my girly "Love U" quilt. Have voted:) Best of luck. I voted also - hope you win - the quilt is a beauty!! I voted for your quilt - it's gorgeous and perfect for a little girl. I have the same fabric in blue/green waiting to be stitched. Good luck - hope you win!